I am revising the Oxford University Press ‘HIV/AIDS Very Short Introduction’, first published in 2008. I had foolishly thought it would be simply a matter of going through the book and updating figures. It quickly became apparent that this was not the case: the world and the issues have moved on. I do believe though, that what I come up with will be definitive, at least for a few years. Unfortunately, this style of writing is not easy during the work week and so it tends to be my weekend labour of love. The only way to do this writing is to have uninterrupted time. If I am going to meet the deadline, which has moved a number of times, I am going to have to close my office door and buckle down during the week. The weather has finally changed here. The temperature on the first Sunday of October, was just 5°C and the highest it got during the day was 13°C. The trees are slowly changing colour and beginning to look quite spectacular. I had forgotten quite how beautifully red and orange they can be. There is also the beginning of leaf fall, a time when living in an apartment has definite advantages: not having to rake leaves, mow lawns and shovel snow are parts of the Canadian experience I don’t engage with. The city of Waterloo and Kitchener are in the process of putting in a light railway. It will be great when it is finished, but that is some years away. Unfortunately, at the moment, most of the work seems to be going on within a few hundred metres of my office and home. That means that we are surrounded by construction. I look out of my office window at numerous vehicles with their lights flashing, diggers, stacks of concrete pipes, and men dressed in protective equipment and high visibility vests. The disruption is considerable and quite depressing. We hope it will be worth it! I had a bizarre experience at one of the yoga classes I attend recently. We were waiting to begin, sitting on the mats and chatting. The subject of cleaners came up and everyone was chiming in with discussions of their domestic help, what they expected of them and their foibles. There was even a discussion of what the staff should be paid. I felt as though I could have been sitting in Durban or Cape Town given the topic and type of conversation. Most people here, it seems, have someone come in to clean their house or apartment once every two weeks. This is the case for me, in fact I have a person who goes over the house with the hoover (she brings her own on the grounds that mine is substandard), wipes down all the surfaces and generally makes it spotless. I have a cleaner who irons my shirts and trousers too. In the last week of September I had a visit from an old friend, Des Gasper, who is at the Institute of Social Studies in the Hague. Our lives have intersected a fair bit over the past 40 years. He was doing an MA and then went on to do a Ph.D. at the School of Development Studies at the University of East Anglia while I was doing my BA and MA. He was in the cohort ahead of me as an ODI Fellow in Botswana in the Ministry of Works and Communications. I reminded him that on his departure, I bought his red 90cc motorcycle. The problem with riding a motorbike in summer in Botswana was that as soon as you put a helmet on, it felt as though your brain was frying. 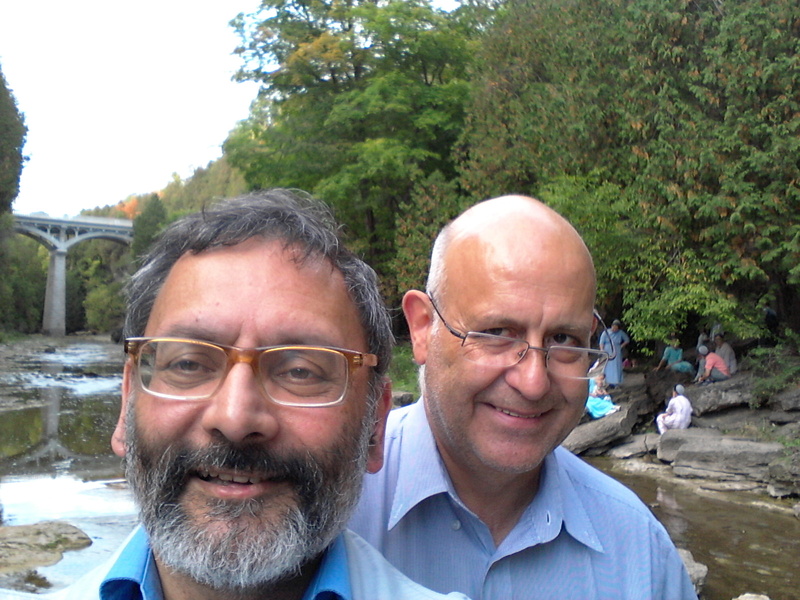 The photograph I have added to the gallery is a ‘selfie’ Des took in the gorge at Elora. One of the problems I have had here is building relationships with the people who care and change things. Accordingly I booked to attend a dinner in support of local charity, The Leacock Foundation. This was started in 1992, by Peter Oliver, an exiled South African and founder of a very successful chain of restaurants: Oliver & Bonacini. This began as The Leacock Club, raising money for children’s charities across Toronto. Thanks to a meeting with Nelson Mandela, it was expanded to support education in in the Eastern Cape of South Africa. It was an interesting dinner. There is both money and good will in Toronto, and Toronto is really not that far away. The conversations, including those with yoga teachers who are not obsessed with domestic workers, have lead me to conceptualise the local project I want to develop. It will be called Kitchener/Waterloo: A Healthy Happy City. This is based on the amazing BBC documentary I saw recently about how health practitioners have come together with politicians, local government officials and others to address the causes of ill health in Liverpool. This would be a real legacy project. When I had my first party of the academic year last night, one guest mischievously suggested we might use one area as the control group. For more information on some of the alternative health organisation and people see waterloo.mokshayoga.ca and danarourke.com. The next instalment of my blog will be written either during or just after a trip to Southern Africa. The Waterford Governing Council meeting is coming round again and that means I need to head for Swaziland. One of the really good things about the party – where I invite a really eclectic range of people – was that two young Waterford alumni were present. When we were doing the round of introductions I announced this pair as two guests I especially welcomed, coming as they do from Swaziland. I feel strong ties to the country in which I was raised. It is yet more pleasing to welcome youngsters schooled in my alma mater, a school I continue to promote and support here in Canada. I think the guests were rather touched when they realised our connectedness. Marc Levy, All Those Things We Never Said, MacArthur and Company, 2010 translated by Chris Murray. I read a book by Levy some months ago and so looked him up and obtained a few more novels through the Waterloo Public Library. One was impossible to get into but this I enjoyed and recommend. It is the story of a high achieving young woman who is estranged from her rich father. Julia is about to get married but three days before the wedding is informed by her father’s personal secretary that dad has died and the funeral is to take place on the day that was to be the wedding. The daughter is incensed that Dad has interfered yet again! Oddly, a bequest, a crate, arrives in her apartment which contains a life like, thinking, reasoning and moving robot of her father. This is a wonderful, suspenseful novel that records one man’s attempt to counteract the misunderstandings that drive parents and offspring apart. This seemed a quite personal account of a father’s attempt to manufacture a way to communicate with a beloved child since previous interactions were all too often soured by ego. Each one’s unconscious craving for love and unconditional acceptance is revealed. It has an ambiguous ending. This entry was posted in Blog, Book Reviews and tagged AIDS, Canada, Cape Town, HIV, South Africa, Swaziland, Toronto, Waterford, Waterloo. Bookmark the permalink. ← Event: The AIDS Pandemic: Nearly Over, or Still Taking a Toll?